Sauron is a fictional character, a supervillain appearing in American comic books published by Marvel Comics. An enemy of the X-Men, Sauron is the alter ego of physician Karl Lykos. In his initial appearances Karl Lykos was portrayed as an evil man and Sauron was simply Lykos in a different physical form, but later stories increasingly depicted Sauron as sharing a Jekyll and Hyde relationship with Lykos. He is an energy vampire who resembles a humanoid Pteranodon after feeding. He often inhabits the hidden prehistoric jungle of the Savage Land. Thomas and Adams originally envisioned Sauron as a bat-like creature, but when they consulted with the Comics Code Authority, they were told that an energy vampire with a bat body might fall under the Code's prohibition on the use of vampires. To get around this problem, Thomas and Adams tweaked his appearance to that of the most bat-like animal they could think of—a pterodactyl—which in turn led them to have Sauron inhabit the hidden prehistoric jungle of the Savage Land. Karl Lykos was the son of an explorer's guide. As a teenager, he accompanied his father to Tierra del Fuego as the elder Lykos guided a wealthy client named Mr. Anderssen and Anderssen's young daughter, Tanya. While defending Tanya from mutant pterodactyls, Karl was bitten by one of the creatures. During his recovery, he discovered that he could now drain the life-force of other organisms. He found himself repeatedly tempted to use his new power, feeling that he needed to drain life energy from other humans or animals to survive. When Karl's father died, Mr. Anderssen took Karl into his home in thanks for rescuing Tanya. As the years passed, Karl and Tanya fell in love, but Tanya's wealthy father would not allow her to date Karl because of his lack of wealth. In an effort to win Mr. Anderssen's support, Karl went to medical school and became a physician, geneticist, and hypnotherapist. He treated patients through hypnosis, but secretly robbed them of energy at the same time. Dr. Lykos became a colleague of Professor Charles Xavier, and first encountered the X-Men when they sought treatment for Havok. Absorbing Havok's mutant energy transformed him into a vampiric, pterodactyl-like monster with human intelligence and superhuman hypnotic powers. He named himself Sauron, after J.R.R. Tolkien's villain (also reminiscent of the word saurus, Latin for lizard), and battled the X-Men, as a would-be conqueror. When he realized that his transformation would threaten Tanya, he fled to Tierra del Fuego. Without energy to absorb, Sauron turned back into Karl. When Tanya tracked him down, Karl threw himself off a cliff to avoid harming her. Karl was presumed dead, but had survived unconscious on a ledge below. He journeyed to the Savage Land and survived in human form by only draining less developed animals. He befriended Ka-Zar and used his medical skills over many months to care for Ka-Zar's allies. But when several X-Men were stranded in the Savage Land, Lykos was overwhelmed with the desire to absorb the powerful life energy of mutants. He transformed into Sauron once again after absorbing Storm's energy. He reverted to human form during a battle with the X-Men, and Ka-Zar explained that Lykos was an ally. Tanya learned that Karl had survived the leap from the cliff. She joined Angel and Peter Parker on a journey to find Karl in the Savage Land. They found Karl, however the Savage Land Mutates used a Genetic Transformer to mutate Angel, Spider-Man and Tanya into animal-like forms. The destruction of the machine forced Lykos to drain energy from the three in an attempt to restore their true forms. Although his gambit succeeded, he subsequently reverted to his Sauron form and joined the Mutates and Zaladane. The X-Men traveled to the Savage Land, and Sauron helped to capture them. However, the X-Men escaped and defeated Sauron and the Mutates. They brought Lykos back to the United States, and at the X-Mansion Professor X seemingly cured Lykos of his condition. Karl and Tanya decided to resume their relationship and a normal life. Lykos was again transformed into Sauron when the Toad used a device of his own design to force Lykos to drain the life energy of Tanya, which killed her in the process. Sauron then joined the Toad's Brotherhood of Evil Mutants, despite the fact that he is not a mutant. Alongside them, he battled X-Force, and slew Cannonball. Sauron was apparently shot dead by Cable, and his body was thrown by Cable to the Morlocks. Sauron was later revealed to have survived the gunshot wound, and battled X-Factor. Sauron went on to menace the X-Men and other heroes on a number of occasions. Later, Sauron had the Savage Land Mutates kidnap Havok, hoping to use his energy to satiate his hunger. When his teammates Cyclops, Phoenix, and Polaris came to the rescue, Sauron had both Summers brothers placed in an energy-transferring machine, and the mix of energy mutated Sauron even further, making him larger and stronger than ever. Phoenix tried to engage Sauron on the Astral Plane, but it was Lykos' personality who prevailed, making a suicide leap into the abyss of his own mind, taking his hated alter ego with him. As a result, Sauron's mind appeared to be stuck in an animalistic state. After being imprisoned in the Raft for refusing to participate in any more Weapon X assignments, Sauron escaped during a jailbreak concocted by the Skrulls. For a time the Avengers believed he and the Mutates were responsible for the breakout, and pursued him to the Savage Land. Sauron and his allies there briefly held the new team of Avengers hostage, but the team freed itself thanks to Iron Man's voice-activated armor, and were about to interrogate him, when he was shot through the head by the second Black Widow. Sauron had absorbed Wolverine's regenerative healing factor and recovered from his injury, just in time to be soundly defeated by the New Avengers. He was taken back into custody, but not before returning the favor to Black Widow by burning her with his fiery breath. Sauron was placed in S.H.I.E.L.D. custody and Maria Hill planned to return him to Weapon X.
Sauron allied with Ka-Zar, Shanna the She-Devil, Zabu, and the natives when the Skrulls were invading the Savage Land. Sauron was among the villains analyzed by Quasimodo for Norman Osborn. Sauron later had a fight with Wolverine. Amphibius later tells Sauron and the other Savage Land Mutates that Magneto's Asteroid M has risen from the sea, but they didn't want to go find him. Worm took control of Barbarus, Lupo, and Sauron and commandeered a ship to go find Magneto. When threatened by the Japanese military, Sauron attacked an armored car, causing an international incident. Cannonball, Sunspot and Warlock investigated and found the Savage Land Mutates on the deck of the ship. Cannonball managed to defeat Sauron while the other New Mutants defeated the Savage Land Mutates. Upon learning why the Savage Land Mutates were on the ship, Karma told Worm, Sauron, Barbarus and Lupo that they were in charge of Asteroid M and Magneto. Worm then orders the Savage Land Mutates to return to the Savage Land. Upon becoming the new leader of the Japanese underworld, Sabretooth held a party that Sauron attended with other enemies of Wolverine. Wolverine arrived and beat them up. Kade Kilgore of the seventh incarnation of the Hellfire Club recruited Sauron to become a staff member at the Hellfire Academy. Sauron later collaborates with Stegron in a plan to turn humanity into dinosaurs where they fought Spider-Man and the mutant students from the Jean Grey School for Higher Learning. The duo's plans are unraveled by their own infighting, purposely exacerbated by their mutual attraction to Shark Girl, who caused their powers to neutralize each other. Lykos returns working in a military laboratory to enhance his powers, until one of his colleagues is contacted by the Scarlet Spider. Now able to store mutant energy to trigger his transformations at will, Lykos turns into Sauron and attacks the vigilante, but although he wounds the man the Spider came to the base to collect, Sauron is defeated and webbed up to be taken away. In human form Karl Lykos is a normal human, although an accomplished medical doctor, geneticist, and psychotherapist employing hypnotism. He possesses an M.D. and Ph.D. in genetics and psychology. As the result of mutation through infection with a genetic virus by mutant pteranodons, Lykos gained the ability to absorb the life forces of other living things into his body. When Lykos absorbs the energies of superhuman mutants, he transforms into Sauron, and gains a portion of that mutant's powers temporarily. Lykos' Sauron form resembles a large crested pteranodon, extinct except in the Savage Land. Unlike true pteranodons, Sauron has a toothed beak and orange eyes and a basically humanoid build, with legs as long as a human being's. Sauron has a wingspread of twelve feet, and razor-sharp claws on his hands and feet. In Sauron form he has superhuman strength, speed, intelligence, stamina, and durability and is capable of flight. Sauron has to absorb the life energies from living victims to sustain his life. He would revert to human form if he didn't regularly absorb the life force from superhuman beings. The Toad's technology could transform Lykos into Sauron by draining life energy from Tayna Andersson, who is apparently not superhuman. Lykos also has a powerful hypnotic ability that requires direct eye contact to complete. He frequently uses his hypnotic power to give his victims terrifying delusions that allies have become monsters. He can also mentally enslave people to do his bidding, although his control is not perfect, as Portal is resistant to his commands. Due to manipulation by the Weapon X program, Sauron can expel the life force energy in concussive bursts from his hands. At some point prior to his New Avengers appearances, he acquires an additional ability to breathe fire, which he uses to burn the second Black Widow in revenge for shooting him. In the Age of Apocalypse universe, Sauron, redubbed Soaron is a more heroic figure, though he is extremely bad-tempered and reclusive, and he is never seen in human form. He is a member of Forge's group of Outcasts alongside Forge, Toad, Brute, Sonique, Mastermind and Nate Grey. The group traveled the countryside posing as a circus troupe, protected by Mastermind's illusions, in order to keep attention away from them while Forge trained Nate. Soaron would often make sarcastic remarks about the situations the group found themselves in, and constantly referred to Nate as a "whelp". In a mission where the group rescued a large number of humans from a prison train, one of Soaron's wings was seared off, grounding him. He bitterly remarked about this to Forge later, demanding to know if his wing was enough reason to avoid suicidal missions. When Domino and her team attacked the group, Soaron was noticeably absent, but after Nate went to challenge Mister Sinister, who had been hiding with the team attempting to manipulate Nate, Soaron and Sonique, the only survivors, arrived on the scene to save the young mutant. Nate accepted that he must challenge Apocalypse, and told Soaron to look after Sonique. Soaron replied by somewhat fondly advising him, "Don't concern yourself with us, just worry about yourself, whelp." When the Age of Apocalypse was revisited, Soaron appeared along with Sonique, Cloak and Dagger, Blob, and a revived Jean Grey as a member of Sinister's team known as the Sinister Six, a group meant to aid Sinister in destroying the X-Men. It is revealed that Sinister apparently still in the guise of Essex approached both Soaron and Sonique, and with Jean Grey's assistance, brainwashed them into becoming members of his new team - the Sinister Six. When the Sinister Six met the X-Men in battle, Soaron failed in his attempt to kill Magneto. At the last moment, Quicksilver prevented his father's death by sacrificing himself. Enraged at the sight of his dead son, Magneto used his powers to thrust the Silver Samurai's sword straight through Soaron, killing him. In the House of M universe, Sauron became a member of Magneto's palace guard on Genosha. He takes part in the battle against the heroes whose memories have been restored. In the mini-series Wolverine and Power Pack, Sauron was the first villain faced by Logan and the Power children. The kids would have succumbed to Sauron's mind control without Wolverine's assistance. Sauron appeared in a few episodes of X-Men, voiced by Robert Bockstael. This version of Sauron did not possess the fire breath or sonic scream of his comic book counterpart. Also, Lykos was apparently an inhabitant of the Savage Land, as he knew and was friendly with Ka-Zar. Lykos was the victim of Mister Sinister's experiments, forced to feed on energy and transformed into Sauron upon mutant contact. Sauron aided Mister Sinister in his efforts to destroy the X-Men. He later attempted to conquer the Savage Land for himself, but was ultimately defeated. With no mutants left in the Savage Land, Lykos was free to live in peace and welcomed into Ka-Zar's tribe. Sauron appears in the Hulk and the Agents of S.M.A.S.H. episode "Savage Land", voiced by Steven Blum. When the Agents of S.M.A.S.H. 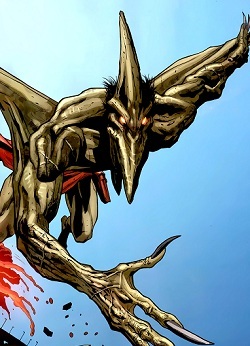 arrive in the Savage Land, Sauron leads an army of laser-mounted Pteranodons in an attack upon their jump jet. During the fight, Sauron drains the energy from one of the Pteranodons where he manages to knock A-Bomb off the jump jet. Saruon states that he and his dinosaurs survived extinction and that man's time on Earth will be at its end. While Sauron controls Devil Dinosaur into attacking A-Bomb and Red Hulk, She-Hulk and Skaar find Sauron's lizardmen allies using a special drill in the super volcano. Sauron is alerted about the situation at the super volcano and commands Devil Dinosaur into finishing the job. Sauron engages Skaar in battle as he tries to mind control him and drains the energies of him and She-Hulk. Hulk, Red Hulk, A-Bomb, and Devil Dinosaur arrive where Hulk fights Sauron while the others work to stop the drill. Sauron then tries to drain Hulk's energy which doesn't work. After the drill was destroyed, a weakened Sauron flees from the Pteranodons. In the episode "Into the Negative Zone," it is revealed that the Leader supplied the weapons and technology for Sauron's plot to cause the super volcano to erupt. In the episode "Mission: Impossible Man," Sauron leads an army of prehistoric sea creatures to attack a seaside amusement park. He ended up fighting the Agents of S.M.A.S.H. and Impossible Man. When Impossible Man manages to trap Sauron, his powers end up absorbed by Sauron who uses them to attack the Agents of S.M.A.S.H. As the Two-Headed Compound Hulk (Impossible Man's combining of Hulk and Red Hulk) is punching Sauron, he sprouts three more heads. Sauron even summoned Fin Fang Foom (who was the only reptile that Sauron couldn't control) to help him. After his absorption of Impossible Man's powers wore off, Sauron tried to absorb Fin Fang Foom's powers only to be knocked out to sea. Following the Two-Headed Compound Hulk punching Fin Fang Foom out to sea, it landed on Sauron who was still in the water. In the episode "Monsters No More," Sauron appears as a member of Leader's Agents of C.R.A.S.H. In the episode "Days of Future Smash: The Dino Era," Sauron was the king of the dinosaur-dominated timeline caused by Leader. He is served by an Ankylosaurus called General Thunder Lizard Rossasaurus in his plot to exterminate the primitive humans. With help from El Diablo and Spider-Raptor, the Agents of S.M.A.S.H. freed the primitive humans and overthrew King Sauron which ended with him falling into a pit of giant spiders. After Hulk thwarted Leader's plans in the Mesozoic era, the dinosaur-dominated timeline shifted to the next timeline. Sauron makes a cameo while crossing a bridge in the first level of the original X-Men game for the Sega Genesis. Sauron makes a small appearance in the Savage Land arena in X-Men: Next Dimension. Sauron appears as a boss in X-Men Legends II: Rise of Apocalypse voiced by John Kassir. Outside of his history with Ka-Zar, he mentions that Apocalypse's lackeys kept trying to get him to join Apocalypse's cause. He makes an extremely brief appearance on a TV screen in Ultimate Spider-Man. He appears as a boss character in Marvel Heroes, voiced by Steven Blum. He appears as a boss character in the Facebook game Marvel: Avengers Alliance. Sauron was ranked #17 on a listing of Marvel Comics' monster characters in 2015. ^ a b Cronin, Brian (11 February 2010). Comic Book Legends Revealed #247, Comic Book Resources. ^ a b O'Neill, Patrick Daniel (August 1993). "'60s Mutant Mania: The Original Team". Wizard: X-Men Turn Thirty. pp. 74–77. ^ Buxton, Marc (October 30, 2015). "Marvel's 31 Best Monsters". Den of Geek. Archived from the original on 2018-09-30. Retrieved 2018-09-30. Sauron is not only a speaking, bipedal, pterodactyl, he also has the ability to drain the life energy from his victim. This page was last edited on 3 March 2019, at 13:30 (UTC).